hybex Media Storage Bottles There is 1 product. 10/pk. Borosilicate 3.3 hybex glass. Autoclavable caps (GL45) and drip rings. Permanent enamelgraduation markings. Area for bottle marking/identification. Autoclavable, reuseable & breakage resistant. 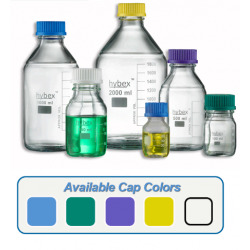 Five Cap colors.